Have Multiple Calls To Action (CTAs): While your landing page should ideally only have a single Call to Action, the thank you page can give multiple choices. One reason for this is that we have the prospects contact and demographic info and now have more leeway in allowing him to choose the funnel path that feels right to him. Any choice the prospect makes is a win, since it pushes the prospect through the funnel. Progressively Profile the user: Some automation systems including Marketo offer the capability to progressively collect prospect info as they continue interacting over time with the content. Progressive Profiling should be used in conjunction with site stickiness to capture as much data as possible. Sync Content Map to Offers: This is Content Marketing 101, but not always implemented in practice. Map out your assets into awareness, consideration, evaluation and purchase (one out of the several flavors out there). Then ensure that your offers on the thank you page fall into multiple categories, not just one. For example, having three content offers all of which are in the awareness phase is not very productive. 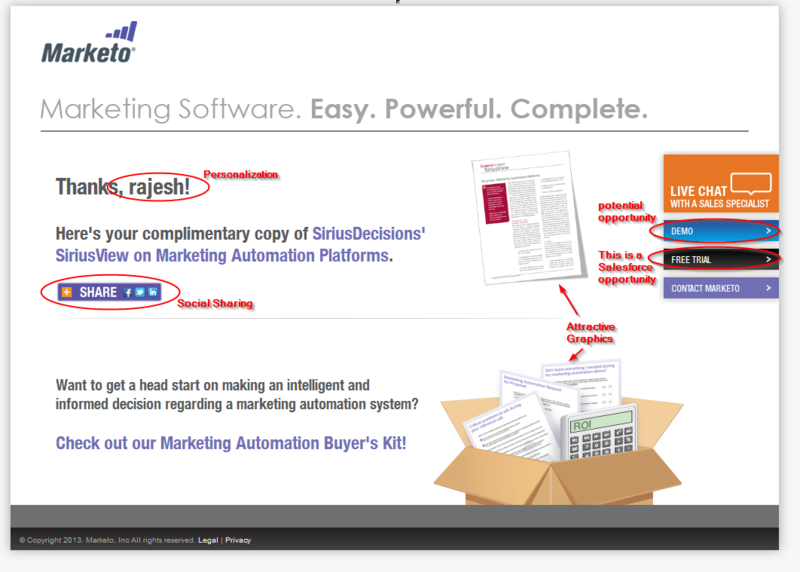 In Marketo’s thank you page, they are offering one that is in the Consideration phase (Sirius Report) while the Marketing Automation Buyers Kit is in the evaluation phase. I put the kit in that phase because the kit is a package of multiple content assets that empower the product champion to push for buying Marketo over other competitors. Quite powerful. Personalize: Some automation systems including Marketo offer the ability to put tokens in landing pages. Use that ability to personalize the offers on the thank you page, since the user has just given his info. Of course, if you are using the prospect’s first name to personalize the page, make sure that this is a required field in the preceding landing page form. Social Sharing: With landing pages, we are prompting the prospect to share his information with us. This requires that we keep the offer very tight without any distractions, including social sharing IMHO. With thank you pages, we are freed from this constraint and should offer sharing across social channels like Facebook, Twitter etc. Of course, make sure you are able to track this so that there is proper source attribution. Have Attractive Graphics: This is true for all landing pages and makes things pop out. Marketo mostly does a great job on this.